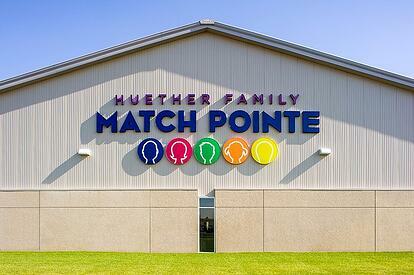 Congratulations to Huether Family Match Pointe on being selected as one of the top 12 tennis facilities in the nation by the United States Tennis Association (USTA). 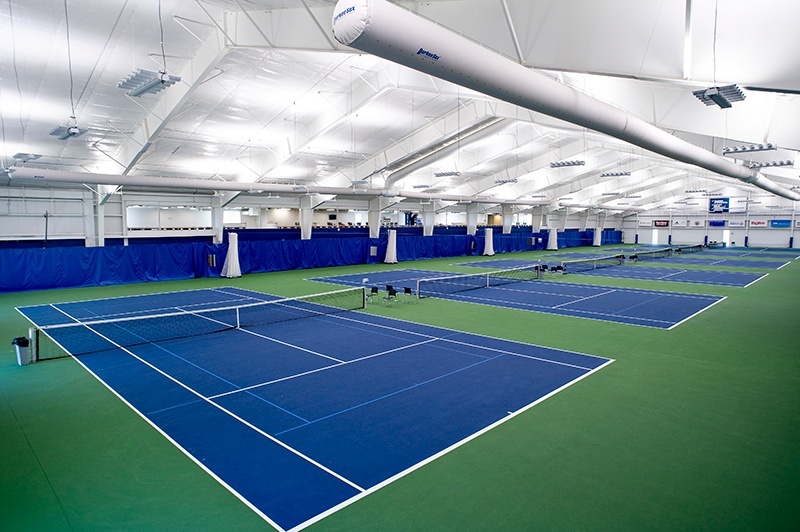 Fiegen Construction completed Match Pointe, a 47,000-square-foot indoor tennis facility located in Sioux Falls, in May 2015. Thanks to Superintendent Galen Van de Stroet, Project Manager Jarrett Hallvin, and Architect Koch Hazard, our team was able to complete construction in just 8 months. The building is adjacent to the Sanford Pentagon and the Sanford Fieldhouse (two more sports facility projects constructed by the Fiegen team) and is sited on six acres of land generously donated by Sanford Health Systems. The $4 million project was funded by municipal and private donations. The City of Sioux Falls earmarked $500,000 in their capital improvement plan for the project. Additionally, the Chamber of Commerce spearheaded a fundraising campaign and, along with hundreds of individual donations, more than $2 million was raised for the facility. Remaining funds were raised through grants and a sizeable personal donation from the Huether family. The USTA Facility Awards program recognizes excellence in construction and/or renovation of tennis facilities throughout the country. Facilities were judged on the following criteria: overall layout and adaptation to site; excellence of court surface and lights; ease of maintenance; accommodations for players, spectators and press/officials; aesthetics; graphics (including the use of signs and landscaping); amenities such as casual seating for spectators, social areas; and the facilities’ participation in USTA programs. Located at 4210 N. Bobhalla Drive, the facility’s features include six championship indoor tennis courts, a viewing mezzanine for spectators complete with elevator access, men’s and women’s locker rooms, a pro shop, and a classroom for community education. Match Pointe offers daily practices, league play, as well as private and group lessons for all ages and incomes. Programs for under-privileged children, seniors, and adaptive players are also available. The facility is also home to the South Dakota Tennis Hall of Fame. The organization, founded in 1989, honors the state’s greatest members of the tennis community. Inductees include individuals who have distinguished themselves either as players, coaches, or contributors. 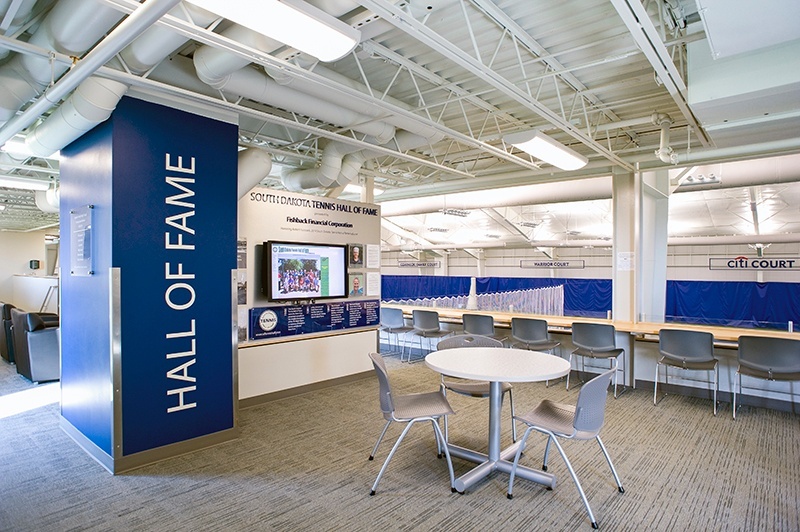 Match Pointe’s mission to develop generations of healthy individuals through the lifetime sport of tennis makes their facility the perfect place to feature the Tennis Hall of Fame. The Fiegen Construction team was honored to work with Huether Family Match Pointe, a public, not-for-profit organization that brings recreational opportunities to citizens of all ages in the Sioux Falls area. We’re proud to have been involved with this award-winning project. Congratulations, Match Pointe!